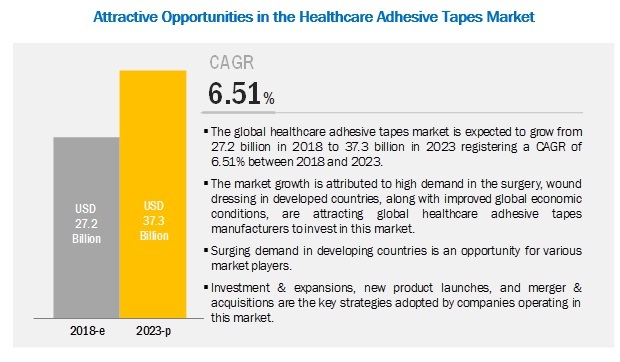 [155 Pages Report] The market for healthcare adhesive tapes is estimated to grow from USD 27.2 billion in 2018 to USD 37.3 billion by 2023, at a CAGR of 6.51% during the forecast period due the high demand for these tapes for primary treatment of wounds by covering and securing to prevent bacterial infections, and to hold bandages in place. They are also used for securing dressings, catheters, and infusion or drainage devices. It comes in a variety of lengths and widths that are designed to meet a wide range of bandaging needs. The growth of the market is due to the increasing use of these tapes in wound care and for surgery in emerging economies such as India, China, Thailand, Indonesia, Brazil, and Argentina. The fabric segment is expected to account for the largest share of the healthcare adhesive tapes market. The fabric segment is expected to account for the largest market share during the forecast period. Fabric tapes have high strength, flexibility, and elasticity, which make them durable. Owing to their strength, these tapes are used for securing dressings, catheters, tubing, and other medical purposes. Their strength and elasticity make them useable on body areas such as the biceps, which expand and contract with movement. The fabric tapes are water resistant and come in a variety of widths, lengths, and styles which are designed to meet an assortment of bandaging needs. These tapes are comfortable and can be removed cleanly and painlessly and are also used for newborn babies. Owing to their fabric backing, doctors or surgeons can mark them with pens to tag surgical scrubs and other equipment. However, these tapes are not used in cases requiring frequent redressing due to their strong adhesion which may cause the skin to peel off. The bandages, transdermal patches, and blister protection application is projected to register the highest growth in the healthcare application. Designed specifically for use in healthcare applications, adhesive tape bandages may be used on fragile or at-risk skin, as well as in moist skin environments. Air permeable, they allow outside air to penetrate and reach the underlying dressing or skin, creating a "breathable" healing and support solution. Transdermal drug delivery patches are used in therapeutic systems to deliver the drug at a controlled rate in a systematic circulation of discrete dosage by utilizing the passive diffusion of drugs when applied to the skin. These tapes deliver the infusion of the drug over a period of time and can be terminated any time by removing the patch. These tapes are similar to the wound tapes, flat and they consist active pharmaceutical ingredients and adhesives which deliver the drugs to the body via human skin. APAC has emerged as the leading consumer and producer of healthcare adhesive tapes. The easy availability of low-cost labor and economical & accessible raw materials are driving foreign investments, thereby increasing the production of healthcare adhesive tapes in the region. The market in APAC is mainly driven by China, which is the leading consumer of healthcare adhesive tapes, globally. India is expected to be the fastest-growing healthcare adhesive tapes market in APAC during the forecast period. The Indian healthcare & hygiene sector is witnessing a phase of rapid transformation and growth, mainly driven by infrastructure development, changing lifestyle and buyers’ preferences. This is expected to drive the healthcare adhesive tapes market in the APAC region. Many international companies are investing in China and India to cater to the market demand. Key companies such as 3M Company (US) and Cardinal Health (US), and medium-sized companies such as Vancive Technologies (Subsidiary of Avery Dennison) and Lohmann GmbH & Co.KG (Germany) have manufacturing facilities in China to cater to the increasing demand. The major vendors in the healthcare adhesive tapes market are 3M (US), Cardinal Health, Inc. (US), Nitto Denko Corporation (Japan), Johnson & Johnson Services, Inc. (US), PAUL HARTMANN AG (Germany), Avery Dennison Corporation (US), NICHIBAN Co., Ltd. (Japan), Smith & Nephew (UK), Lohmann GmbH & Co.KG (Germany), Scapa Group Plc (US), Medline Industries Inc. (US), and Essity Aktiebolag (PUBL) (Sweden). Nitto Denko Corporation (Japan), is one of the largest healthcare adhesive tapes companies. This company has a strong global presence. It has a diversified product portfolio to cater to end-use industries according to their requirements. To sustain its dominating position, the company may enter into new industries and target new markets. In July 2017, Cardinal Health (US) acquired Medtronic's Patient Care, Deep Vein Thrombosis and Nutritional Insufficiency business for USD 6.1 billion. This acquisition provides product offerings which are used across a wide range of applications in the healthcare industry. In April 2017, Essity’s (Sweden) acquired BSN medical, a leading medical solutions company. The company develops, manufactures, markets, and sells products within wound care, compression therapy, and orthopedics. Through this acquisition, the company’s aim is to become leading provider of hygiene and health solutions, globally. What are the mid-to-long-term impacts of the developments undertaken by the key players of the market? Are the manufacturers of healthcare adhesive tapes shutting down their plants because of the poor growth globally in a few applications? Which backing material has the potential to register the highest market share and because of which application? What is the upcoming application for healthcare adhesive tapes? What will be the future of the healthcare adhesive tapes market? 11.13.4 Jiangsu Nanfang Medical Co., Ltd.
11.13.6 Libatape Pharmaceutical Co., Ltd.
11.13.8 Seyitler Kimya San. Inc.
11.13.12 Sterimed Medical Devices Pvt. Ltd.
11.13.14 Wuxi Beyon Medical Products Co., Ltd. The study involved four major activities in estimating the current market size of healthcare adhesive tapes. Exhaustive secondary research was done to collect information on the market, the peer market, and the parent market. The next step was to validate these findings, assumptions, and sizing with industry experts across the value chain through primary research. Both top-down and bottom-up approaches were employed to estimate the complete market size. Thereafter, market breakdown and data triangulation methods were used to estimate the market size of the segments and the subsegments. In the secondary research process, various secondary sources such as Hoovers, Bloomberg, and BusinessWeek were referred to for identifying and collecting information for this study. These secondary sources included annual reports, press releases & investor presentations of companies; white papers; certified publications; articles by recognized authors; gold standard & silver standard websites; regulatory bodies; trade directories; and databases. After arriving at the overall market size-using the market size estimation processes as explained above-the market was split into several segments and subsegments. In order to complete the overall market engineering process and arrive at the exact statistics of each market segment and subsegments, the data triangulation and market breakdown procedures were employed, wherever applicable. The data was triangulated by studying various factors and trends from both the demand and supply sides. 3M (US), Cardinal Health, Inc. (US), Nitto Denko Corporation (Japan), Johnson & Johnson Services, Inc (US), PAUL HARTMANN AG (Germany), Avery Dennison Corporation (US), NICHIBAN Co., Ltd. (Japan), Smith & Nephew (UK), Lohmann GmbH & Co.KG (Germany), Scapa Group Plc (US), Medline Industries Inc. (US), and Essity Aktiebolag (PUBL) (Sweden). This research report categorizes the healthcare adhesive tapes market based on resin, backing material, application, and region.